Three case reports published in the New England Journal of Medicine demonstrate the promise of cancer immunotherapy in gray zone lymphoma, a rare subtype that mixes characteristics of Hodgkin and Non-Hodgkin forms of the disease. In one case from the University of Colorado Cancer Center using nivolumab and two from the National Institutes of Health using pembrolizumab, treatment with immune therapy "checkpoint inhibitors" followed unsuccessful therapies and was based on clinicians' ability to match the mechanism of the drug with the known molecular alterations in this lymphoma. 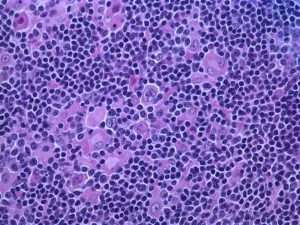 These three cases represent the first successful uses of immune therapies in gray zone lymphoma, potentially paving the way for clinical trials utilizing this strategy in this and related conditions. "For me, trying nivolumab was a binary choice: I could try the drug or I could give up," says Bobbie Flexer, PhD, the patient treated at CU Cancer Center. Flexer, a retired mathematics education professor from CU Boulder, had not improved after multiple rounds of chemotherapy and radiation therapy. Genetic testing of Flexer's tissue showed focal over-expression of the protein PD-L1. This protein displayed on a tumor cell's surface acts as a white flag telling the immune system's T cells not to attack. Specifically, T-cells probe other cells with their own cell-surface protein, PD-1, and it is the interaction between PD-1 and PD-L1 that can disarm the immune system against a marked cell. A major strategy of cancer immunotherapy is to block this interaction between a T cell's PD-1 and a cancer cell's PD-L1. If one is blinded from seeing the other, the immune system can be reactivated to attack cancer cells. This is the strategy of nivolumab. It blocks PD-L1 from binding to PD-1 (it inhibits this checkpoint) thus removing the immune system's blinders to cancer. The drug is approved as a first-line therapy for metastatic melanoma and has also been used to treat non-small cell lung cancer, Hodgkin disease and renal cancer. It had not previously been used against gray zone lymphoma. 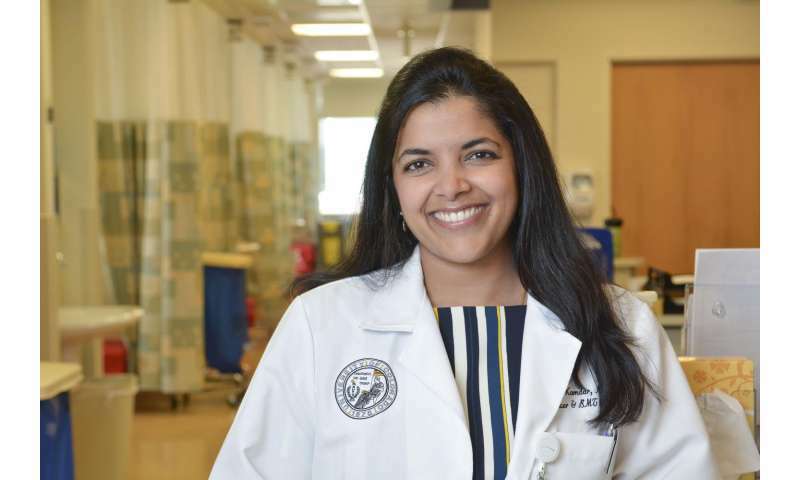 "It was a leap of faith when we started the drug," says Flexer's oncologist, Manali Kamdar, MD, investigator at the CU Cancer Center and Clinical Director of Lymphoma Services at University of Colorado Hospital. Kamdar joined the Center in fall 2014 to establish the lymphoma program. She explains that there are about 100 different types of lymphoma, one of which is gray zone lymphoma. "It's so gray that no one knows how to spell it—should it be an 'e' or an 'a' in gray?" Kamdar says. "This is true to the point that not every pathologist will even call it gray zone lymphoma. This highlights the importance of academic medical centers. If you have a diagnosis of a rare subtype of lymphoma, it is pertinent to get a second opinion at an academic medical center to avoid misdiagnosis." Chemotherapy is only effective in roughly 50 percent of grey zone lymphoma, due in part to the aggressive nature of the condition and in part to the difficulty of obtaining a correct diagnosis. "It should have a more striking, appalling name. 'Gray zone' sounds like it's a mild case of something or other," Flexer says. At the time of her diagnosis, Bobbie described herself as an "exercise addict," going to about four workout classes and walking with friends twice per week. Then, "I had a period of shortness of breath, a cold and suddenly I felt like I had pneumonia," she says. An x-ray showed fluid in her lungs, and after the procedure to remove this fluid, a nurse prepared Bobbie for discharge from the hospital, which included a routine test of blood level oxygen. When the test came back low, Bobbie changed from her street clothes back into a hospital gown. It was the start of a long process of diagnosis. The process of treatment has been even longer. Bobbie started with combination chemotherapy known as R-EPOCH, which includes an antibody therapy called rituximab along with chemotherapy consisting of etoposide, prednisone, vincristine (Oncovin) and doxorubicin hydrochloride. Unfortunately, after six cycles of the therapy, Bobbie's PET scan showed that her disease had progressed. "Given Bobbie's age and her resistance to chemotherapy it was difficult to simply increase her dose. Bobbie's tumor biopsy expressed a protein called CD30 and so we started her on brentuximab, which targets these CD30 cells," Kamdar says. The drug is one in a class of what are called "antibody-drug conjugates" in which an antibody is designed to seek a cell-surface protein, bringing along the payload of chemotherapy. In this way, brentuximab delivers chemotherapy more exclusively to cells marked by CD30. "Unfortunately Bobbie's disease progressed through multiple cycles of brentuximab. Subsequently we switched her to another combined chemotherapy, namely gemcitabine with oxaliplatin," Kamdar says. "It's a very old, very rough form of chemo. 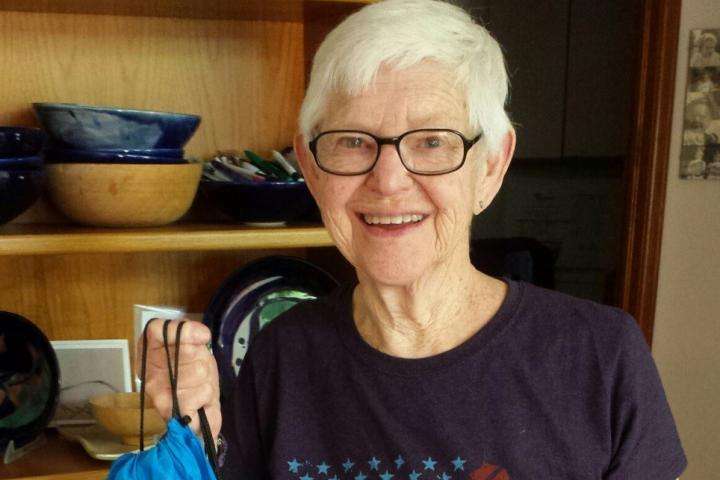 She looked like hell," says Bobbie's husband, Abe, a retired faculty member of the CU Boulder Department of Molecular, Cellular and Developmental Biology. Bobbie was not tolerating this latest attempt at chemotherapy. Besides another PET scan showed that it was doing little good. "At that point, I knew that one recommendation was, 'oh gosh, she's 80 years old, don't do anything.' But Dr. Kamdar is really on top of everything—you can't breathe heavily and not have her look into something. Dr. Kamdar had to come up with something new," Bobbie says. That something new was nivolumab, which Bobbie and Dr. Kamdar hoped would unleash Bobbie's own immune system against her disease. "This was a new drug and Dr. Kamdar explained very thoroughly that it would be an off-label use. She made it clear there aren't a lot of data where I am," Bobbie says. "Still, she thought it might be worth a try. We went for it." "Within one dose, she was in less pain and she looked much better," Kamdar says. A PET scan after six doses showed that Bobbie's gray zone lymphoma was in complete remission. Of course, the treatment hasn't been without side-effects. "When they put you on a drug at the hospital, they tell you how it's supposed to act and they tell you all the side effects. They hand you a written sheet of what can go wrong. For nivolumab, they said think of every organ in your body - any one or more may become inflamed," Bobbie says. The goal of the drug is to cajole the immune system into specifically attacking a patient's cancer. But with brakes removed, the immune system may also attack other tissues that use PD-L1 to keep themselves safe. For Bobbie, this meant two bouts of pneumonitis, an inflammation resulting from her immune system's activation against her lungs. "They treated it successfully with a prednisone burst each time," Bobbie says. She also experienced an uptick in pancreas enzymes that caused high blood glucose levels. Bobbie is learning to treat that side-effect with insulin. And dietitians at University of Colorado Hospital helped her manage expected gut related side effects. Bobbie Flexer has now been on nivolumab for over half a year. To Kamdar, the case was striking enough to warrant submitting a report to the New England Journal of Medicine. Interestingly, the editor at the journal had just received two similar case reports from the National Institutes of Health, using the related immune therapy pembrolizumab to target the condition in a nearly identical way ("The idea had found its time," says Kamdar.") Alone, any one of these cases may not have earned publication; together they form a compelling picture of a new strategy to target gray zone lymphoma. "Now she's back on the drug and doing fairly well, in complete remission," says Kamdar. "In addition to being fortunate enough to have the excellent facilities at the CU Cancer Center and UCHealth Bone Marrow Transplant Center available to me, I was lucky enough to have a very bright, knowledgeable, and caring oncologist who was not willing to give up on someone who was 80 and presenting with a very bad diagnosis," Bobbie says. "I was also fortunate that my husband saw his role as a partner in this long and complicated project and took on the tasks of primary caregiver and medical researcher. Our daughters and granddaughter have been huge supports, flying in to Colorado from each coast regularly. Finally, our extended family and friends have been terrific, willing to ride the roller coaster with us." These three cases demonstrate the ability of knowledgeable clinicians to infer rational treatments based on the genetic specifics of a patient's disease. The cases also show the potential for new, genetically-targeted medicines to transcend the disease for which they were developed. Seeing gray zone lymphoma not only as a cancer of the lymph nodes, but as one in a larger class of cancers dependent on use of the protein PD-L1 to evade the immune system allowed Manali Kamdar to match the right patient with the right drug, and now allows Bobbie Flexer extra months and even years of life.